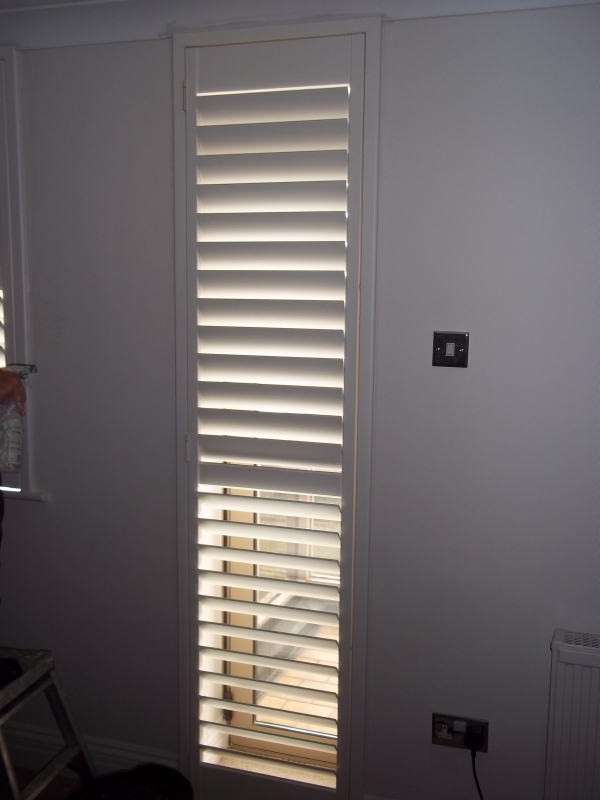 Wooden Shutters needn’t only be for windows, full length shutters are often used by our customers for their French Doors which look out into their gardens, which can have direct sunlight pouring into your room. This can cause light damage to your furnishings. Some customers wish to have the option of additional privacy, at times, and full length shutters can provide a great privacy and can direct light into your room as you wish. The full length shutters shown in this Barn Conversion in Buckinghamshire are finished in white, manufactured using poplar wood and have the open sky option, which means that to operate the slats in the shutter panels either open or closed, the customer will have to simply tilt one of the other slats, and the rest will move in unison. Our Buckinghamshire customers have chosen with the consultant to have a mid-rail incorporated into the shutter panels during the manufacturing stage. This mid-rail is half way up the panel and this break not only adds extra stability to the full length shutter panel but also provides a break in the workings of the shutter which allows the slats above the mid-rail to operate separately from those below the mid-rail. This gives your full length shutters great flexibility in how they are used and how they work, directing the light according to the different times of the day, allowing maximum light into your room when you want, and creating shade when you wish. Full length shutters not only look great at French windows and can tie in with your home furnishings, they provide a practical solution to light entering your home and can protect your furnishings from possible fading as well as giving your home extra privacy.